Commercial pilot C.B. 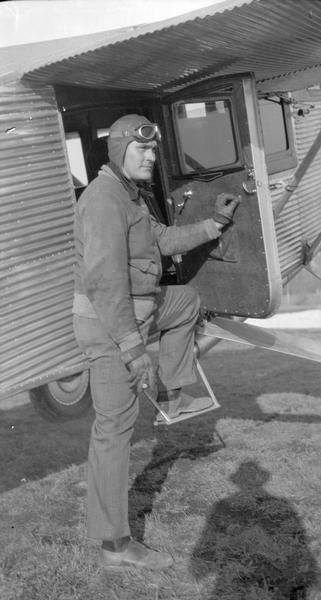 "Cash" Chamberlain posed with a Hamilton Metalplane owned by Universal Airlines. Chamberlain began his flying career with the Walter Liskowitz airline company of Waukesha. Later, he flew as a test pilot for the Hamilton Metalplane Company in Milwaukee and for Universal Airlines. When Northwest Airways purchased nine Hamilton planes Chamberlain went along as part of the deal. Chamberlain died in a plane crash in Montana in 1939.